The dollar dominated once again, with multi-month gains against major currencies. Is it time for a correction or will this trend continue? German Ifo Business Climate, US housing data, Durable Goods Orders and GDP are amongthe highlights of this week. Follow along as we explore the Forex market movers coming our way. This was quite a week in financial markets: upbeat US data (especially housing) pushed the dollar higher, and it later got a boost from the not-too-dovish FOMC minutes. In Jackson Hole, Janet Yellen’s much awaited speech did not contain any major surprises, and that was enough to keep the ball rolling for the US dollar. EUR/USD dropped to an 11 month low, also due to ongoing tensions around Ukraine and despite not-too-shabby PMIs. The pound was hit hard by weak inflation and despite two members voting for a rate hike. The Aussie showed resilience, defying a weak Chinese figure. German Ifo Business Climate: Monday, 8:00. German business mood continued to deteriorate in July reaching a worse than estimated reading of 108.0, following 109.7 reading posted in June. Tensions in Ukraine and the Middle East remained the chief concern of German businesses. Easing economic momentum after a strong first quarter also contributed to this fall. Domestic activity remained elevated pointing to growth. Business climate is expected to fall to 107.1 this time. US New Home Sales: Monday, 14:00. The U.S. housing market was unable to gain traction in June posting a lower than expected annualized pace, reading of 406,000 from 442,000 in May. Analysts expected sales to pick up to 485,000. Restrictive lending rules, limited land supply and higher mortgage rates weigh on the housing market. Federal Reserve Chair Janet Yellen expressed her concern that the industry is underperforming. New home sales is forecasted to reach 426,000 in July. US Durable Goods Orders: Tuesday, 12:30. Orders for long-lasting U.S. manufactured goods edged up more than expected in June rising 0.7% amid a rise in demand from transportation to machinery and computers and electronic products. The reading was well above predictions of a 0.4% rise following May’s 0.9% decline, suggesting a growth trend in the economy at the end of the second quarter. Meanwhile Core orders picked up 0.8% after a flat reading in May, while expected to gain 0.6%. Orders for durable goods are expected to pick-up 7.4% in July, while Core orders are predicted to gain 0.5%. US CB Consumer Confidence: Tuesday, 14:00. US consumer confidence rose in July to a nearly seven-year high, reaching 90.9, the highest since October 2007. This increase was higher than the 85.5 anticipated by analysts and followed 86.4 points posted in July. The labor market growth trend had a positive effect on consumer spending and equity markets remain strong. Nevertheless, the Federal Reserve policy makers are forecast to keep interest rates low well into 2015 even as they stop monetary stimulus. Consumer confidence is expected to reach 89.1 this time. US Unemployment Claims: Thursday, 12:30. US Jobless claims fell by 14,000 to 298,000 last week showing the labor market is making progress hand in hand with the growth momentum in the US economy. Last week’s reading was much better than the 302,000 reading expected by analysts. The four week average of claims, a less volatile measure than the weekly figures, increased to 300,750 last week from 296,000. The number of people on jobless benefit rolls dropped by 49,000 to 2.5 million in the week ended Aug. 9, posting the lowest level since June 2007. Jobless claims are predicted to rise 299,000 this week. US Pending Home Sales: Thursday, 14:00. The number of contracts to buy previously owned homes declined 1.1% in June, following a 6.0% gain in May, worse than the 0.2% decline forecasted by analysts. The unexpected fall indicates residential housing is struggling to gain momentum. Limited availability of credit and sluggish wage growth were the main cause for this setback, making it harder for potential buyers to close real estate deals. Federal Reserve Chair Janet Yellen has underlined the sluggish state of the housing market. Analysts believe, the housing market will not get better until a more substantial improvement will occur in the labor market and wage growth. Pending Home Sales are expected to rise 0.6%. Canadian GDP: Friday, 12:30. The Canadian economy expanded in May at the fastest pace in four months rising 0.4% amid a surge in car production. The increase followed a 0.1% gain in April. Analysts expected a smaller rise of 0.3%. Canada registered the fifth consecutive monthly gain, indicating the economy is getting stronger. The central bank estimates a 2.5% gain in the April-to-June period. Manufacturing increased 0.8%, led by a 13% climb in motor vehicle production. Wholesalers registered a 1.2% gain in output in May, making the sector the second largest contributor of growth during the month. The expansion was visible across the board. The economy’s growth rate is expected to reach 0.3% now. The US Dollar has advanced for six consecutive weeks. That represents the most consistent run for the currency since February of last year – which happened to be the most prolific leg of a two-year bull run through the July 2013 peak. While the dollar’s move this time around is more discrete and less momentous than its predecessor, the consistency is nevertheless impressive. Where traders should be concerned is that the difference may extend to the broader extension of the larger trend. Looking into the dollar’s backdrop, there is little of the fundamental motivation we would normally expect the currency to advance on. Without a turn in speculative appetites, groundswell in the market’s rate forecasts or material drop in other majors; the dollar’s rally is likely to stall. While this past week highlighted a number of impressive moves from benchmarks (Dollar, S&P 500, Yen crosses), trend development is still difficult to maintain in an environment of complacency. And, a lack of conviction is still the most universal aspect of the financial system. A prime example: from the S&P 500’s drive to fresh record highs, the market failed to top 2 billion shares for the week – one of the quietest non-holiday trading periods on recent records. Participation in even the most prolific trends is lacking. So, if there is a lack of drive to the markets, why have US equities and the dollar gained so much ground recently? For the Index, the motivation was speculation. The swell in ‘risk premium’ through the first half of the month presented traders another opportunity for short-term gains so long as volatility remains deflated. That premium has since been exercised, and further gains now fall more on the shoulders of true trend development. A similar opportunistic appeal was seen in the currency. Motivated declines in key counterparts – Euro, Pound, Yen – translated into consequent gains for their most liquid counterpart. Once again, progress from here requires more. Looking out over the coming week, the need for an active catalyst is much greater. From a cross-currency gains perspective, USDJPY needs robust speculative appetite to advance; GBPUSD has already slid seven strength weeks (matching the longest decline in decades); and the retreat in NZDUSD has put the kiwi into an almost excessively dovish light. As the FX market’s most liquid pair, EURUSD could strong-arm dollar gains, but there is limited cannon fodder to supply that motivation. The long-elusive risk aversion theme that could leverage the dollar’s safe haven status is a very high potential candidate, but a dedicated deleverage is a low probability. Moreover, the currency’s full appeal in this all-consuming theme only really hits its stride when the need is liquidity – not just booking profit. A pullback in US equities after this past week’s premium drawdown is likely, but the necessary conviction to fully turn this trend may be beyond what the market’s participation levels are capable of. As has been the case for some months, the dollar’s most accessible source of untapped strength is an upgrade in interest rate expectations. While the consensus of economists and money managers is for a first hike sometime mid-2015, the market is positioned for something far more distant. Even the Fed’s end-2015 and 2016 rate forecasts (1.12 and 2.50 percent respectively) are met with serious skepticism by the market (0.72 and 1.70 percent). The cadre of unscheduled Fed speakers – and Chairwoman Yellen – this past week was unable to close the gap. The calendar this week may be able to make a dent between economic activity, housing and sentiment readings. However, the most prominent listing will be Friday’s PCE - the Fed’s favored inflation reading. If this theme fails to step up, we may find the dollar stalled or even in retreat. The Japanese Yen tumbled towards yearly lows versus the US Dollar, and key data in the week ahead could decide whether the USDJPY makes a sustained break of its year-to-date trading range. 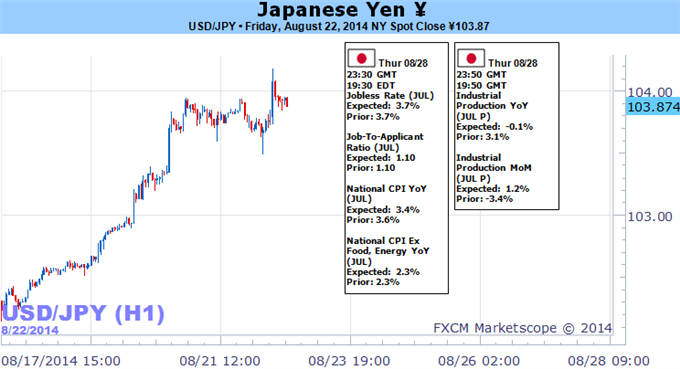 Traders sent the Yen steadily lower despite a relatively empty economic calendar and limited market-moving news headlines. Event risk picks up as we look to the Jackson Hole Economic PolicySymposium over the weekend, while Japanese Jobless Rate figures as well as National Consumer Price Index inflation results could drive moves through late-week trading. Early indications suggest that the Jackson Hole conference may prove far less significant than expected. Yet it’s worth noting Bank of Japan Governor Haruhiko Kuroda will join Bank of England Deputy Governor Ben Broadbent and Central Bank of Brazil Governor Alexandre Tombini on a panel to discuss “Labor Markets and Monetary Policy” on Saturday morning. Any important policy announcements or changes in forecasts seem unlikely, but we can’t rule out any gaps in JPY and GBP pairs through Sunday’s market open. It may subsequently take major surprises out of upcoming Japanese inflation and jobless figures to drive a more substantial Yen breakdown. Traders have shown little interest in anything except sharply worse-than-expected domestic economic data, and the week ahead will likely prove no exception. It seems cliché to claim that a specific currency is “at a crossroads”, but it is no exaggeration to claim that it may be a make-or-break week for the Yen as it trades near critical support. Major currency reversals often coincide with the beginning and end of the calendar month, and the fact that we’re headed into the final week of August puts special focus on the fast-falling Yen. Traders for their part remain positioned for a USDJPY breakout; futures data show large speculators are near their most short JPY (long USDJPY) since December. FX options show that Yen volatility prices remain near multi-week highs but remain fairly low by historical standards. It may take a significant build in FX volatility to drive the next leg of Japanese Yen weakness. The GBP/USD slipped to a fresh monthly low of 1.6560 even as the Bank of England (BoE) Minutes showed Martin Weale and Ian McCafferty voting for a 25bp rate hike at the August 7 meeting, but we may see the British Pound regain its footing ahead of the next interest rate decision on September 4 should the fundamental developments coming out of the U.K. further boost interest rate expectations. Even though the BoE anticipates the strength in the British Pound to dampen the risk for inflation, the ongoing improvement in the labor market may continue to boost the scope for stronger wage growth in the U.K., and it seems as though the Monetary Policy Committee (MPC) will do little to halt a further appreciation in the sterling as it helps to deliver price stability. With that said, a further expansion in private-sector lending along with a pickup in household confidence may generate an improved outlook for the U.K. economy, and a slew of positive developments may put increased pressure on the BoE to normalize monetary policy sooner rather than later as the central bank anticipates a stronger recovery in the second-half of 2014. Credit Suisse Overnight Index Swaps are current pricing a 40bp rise in the benchmark interest rate over the next 12-months, and it seems as though we would need a further pickup in price growth to boost rate expectations as the headline reading for U.K. inflation cools to an annualized 1.6% from 1.9% in June. Nevertheless, the technical outlook continues to highlight a risk for a further decline in the GBP/USD as the Relative Strength Index (RSI) pushes deeper into negative territory, and the descending channel carried over from the previous month may continue to take shape over the near-term as the BoE softs its hawkish tone for monetary policy. Given the lack of major local events the main risks of the AUD/USD breaking from its recent range are likely to stem from its US counterpart. Refer to the US Dollar outlook for insights into how the USD side of the equation may influence the pair. A lull in high-profile domestic news-flow puts external forces in the spotlight as the primary drivers of New Zealand Dollar price action in the week ahead. The central issue on this front continues to be the evolution of the expected time gap between the end of the Fed’s QE3 asset purchases in October and the first subsequent interest rate hike. The formative role of US monetary policy in supporting risk sentiment is hardly controversial at this point; one need only compare the five-year trajectory of the S&P 500 and the US central bank’s balance sheet to see it. As stimulus helped build out the risk-on rally since the end of the 2008-09 crisis, so too a shift toward a more hawkish posture may undermine it. As the highest-yielding currency in the G10 FX space, the Kiwi stands out as particularly vulnerable if risk appetite unravels and capital flees return-oriented assets for safer shores. The prospect of a sooner-than-expected start to Fed tightening may trigger just such a dynamic. The Fed notably upgraded its language on inflation in July’s FOMC statement, saying the “likelihood of inflation running persistently below 2 percent has diminished”. This tone shift and its supportive implications for the possibility that stimulus removal will begin relatively sooner than otherwise was further brandished in minutes from last month’s sit-down as well as Fed Chair Yellen’s comments at the Jackson Hole Economic Symposium. The week ahead brings ample opportunities to build on this narrative, with a flurry of US economic data releases due to cross the wires. July’s Home Sales and Durable Goods Orders as well as Augusts’ Markit PMI and Consumer Confidence figures are all on tap. In trend terms, the performance of US economic news-flow has markedly improved since early April. Indeed, a Citigroup index measuring realized outcomes relative to consensus forecasts now shows data results are outperforming expectations by the widest margin in six months. This hints that analysts are underestimating the vigor of the US economy, opening the door for upside surprises on upcoming reports that amplify Fed rate hike bets and punish the Kiwi further. Gold prices are sharply lower this week with the precious metal off by more than 2.1% to trade at $1276 ahead of the New York close on Friday. The decline marks the second weekly loss and takes bullion into fresh nine-week lows as the greenback continued to rip higher with the Dow Jones FXCM Dollar Index climbing nearly 1% in its single largest weekly range since mid-April. A string of strong reports out of the US coupled with a slightly more hawkish tone to the minutes from the latest FOMC policy meeting has kept the dollar bulls in control with gold trading heavy as easing geopolitical concerns and a more upbeat assessment of the economy continued to buoy risk higher alongside the greenback. All eyes fell on Jackson Hole Wyoming on Friday for the Kansas City Economic Symposium with Janet Yellen’s keynote speech largely striking a balanced tone. The Fed Chair noted significant under-use of labor resources while citing room for wage increases that would remain rather benign on inflation. She seemed to play both side when it came to interest rates, noting that slower progress on goals may delay rate increases while faster progress would bring hikes sooner. The result offered little direction for gold prices which traded sideways into the close of the week after posting 5-days of consecutive declines to break into fresh monthly lows. Looking ahead to next week, traders will be closely eyeing the second print for 2Q GDP with consensus estimates calling for a slight downward revision to an annualized pace of 3.9% from 4% q/q. July durable goods orders, pending home sales, and the final read for the August University of Michigan Confidence survey are also on tap next week and we’ll look for stronger data to broadly remain supportive of the dollar / limit gold advances. The biggest possible supportive variable for gold would be a more substantial sell-off in stocks with such a scenario likely to fuel risk-off flows into the perceived safety of the yellow metal. That said, the technical picture remains rather bleak. From a technical standpoint, gold remains within the confines of a well-defined descending channel formation off last month’s high and our focus remains lower while below the 200-day moving average at $1284 with interim support seen at $1271. A break below this level eyes a key support zone at $1251/58 backed by $1233 and $1206. We’ll reserve $1292 as our bearish invalidation level with a breach above targeting key resistance at $1321. 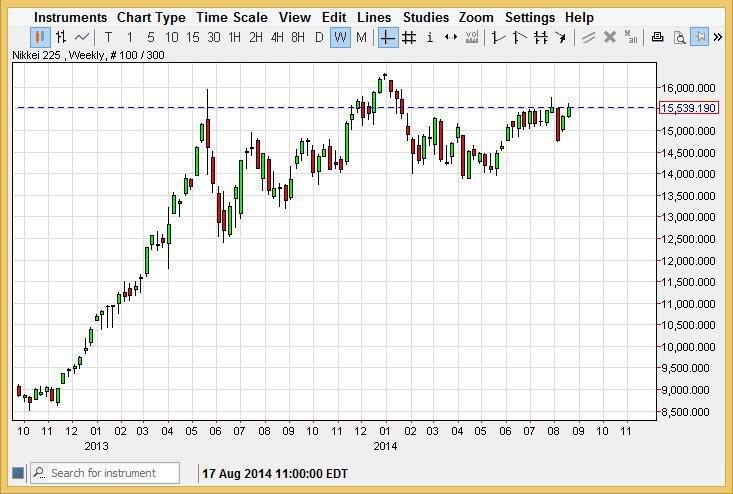 The Nikkei had a slightly positive week as you can see, closing above the ¥15,500 level. Because of this, we think that the Nikkei will continue to go higher, and quite frankly believe that pullbacks will simply attract more buyers anyway. With that, we are bullish and have absolutely no interest in selling this market until we break down well below the ¥14,000 level, something that looks very unlikely at this moment. With that, we believe that the market will then go to the ¥17,000 level, and ultimately to the ¥20,000 level which is our longer-term target. The DAX as you can see gapped higher at the open of the week, and then went all the way up to the €9400 level before turning back around. Nonetheless, we are still bullish of this market as we did break the top of a shooting star from the previous week, which of course is a very bullish sign. We also recognize the €9000 level as been a bit of a “floor” in this market, so we would be very interested in buying supportive candles closer to that area as well. Anyway, we feel that this market goes back to the €10,000 level given enough time. 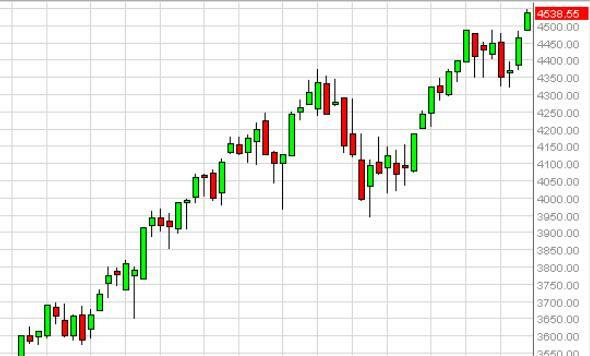 The NASDAQ had a positive week, clearing the 4500 level without too many issues. The NASDAQ looks like one of the best stock indices in the United States right now, and as a result we are very bullish of this market and believe that we just started the next leg higher. 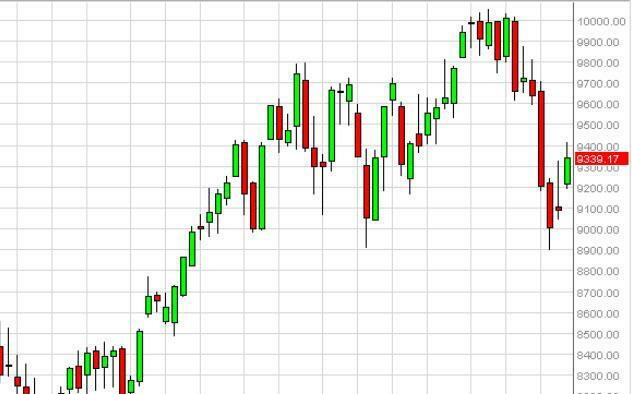 This leg higher should send this market to the 5000 level, and possibly even beyond that. Pullbacks will continue to be buying opportunities in this market, and we have absolutely no interest whatsoever in selling this market presently.